QtWebKit web browser QupZilla 1.8.1 has been released recently. Here is how to install / upgrade it in Ubuntu 14.10, Ubuntu 14.04, Ubuntu 12.04 and their derivatives. 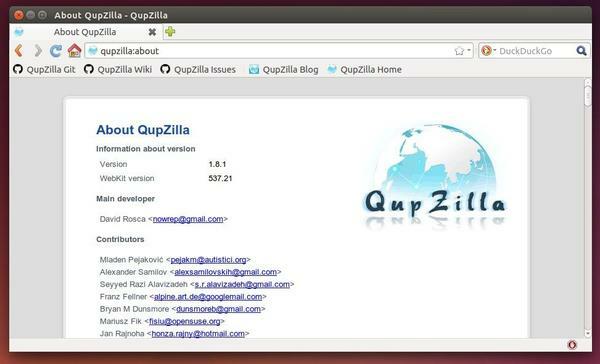 QupZilla is a free and open source browser that uses QtWebKit engine. Additional effort was put into seamless integration of the browser with the native look and feel of users’ desktops. Some additional features of the browser include the integration of history, web feeds and bookmarks in a single location, the ability to take a screenshot of the entire page, and Opera-like “Speed dial” home page. It is reported to consume fewer system resources than the major general purpose browsers like Mozilla Firefox and Google Chrome. The latest binaries have been made into PPA available for Ubuntu 12.04, Ubuntu 14.04 and Ubuntu 14.10. If you don’t want to add the PPA, grab the .deb package directly from this page. After that, you can launch the browser from Unity dash and receive future updates by running regular update via Software Updater.